We are currently updating this study. The second edition will presumably be published in the second quarter of 2019. In 2016, the global plastics market reached a volume of over 263 million tonnes. According to the demand volume and price development for the individual types of plastics, Ceresana expects revenues to rise to about US dollar 560 billion until 2024. The data regarding quantities and revenues do not include synthetic fibers nor their use in paints and varnishes, adhesives and sealants. Synthetic resins such as epoxy, phenolic, melamine, and urea formaldehyde resin as well as silicones are not analyzed either. With a market share of over 51%, Asia-Pacific is the region with the largest plastics demand; North America, Western Europe, Eastern Europe, and South America follow. China and the USA are the major consumers of plastics worldwide. In this market report, Ceresana analyzes the development of every individual product type and application area in several regions and countries. In 2016, the plastics sales markets flexible packaging, construction products, and rigid packaging dominated: These three segments account for about 65% of the total demand for plastics. The sales markets with the highest growth rates of more than 3% per year are, however, the segments automotive and electrical and electronics. Flexible packaging such as bags and sacks as well as shrink and stretch films are mainly used for food packaging, but also as a secondary and tertiary packaging, for example for transportation. Plastic films may be used as shopping bags, trash can liners, mailing bags or as large bags for industrial and agricultural goods. Worldwide, about 60.8 million tonnes of plastics were utilized in flexible packaging in 2016. In civil engineering and building construction, plastics are mainly used for films, cables, pipes, profiles and covers, sheets, fastening elements such as dowels and screws, glazing, coatings, and membranes. 54.8 million tonnes of plastics were utilized for building applications in 2016. The Asia-Pacific region is by far the largest consumer. The sales market rigid packaging includes containers such as cans, cups, trays, bottles, boxes, and caps. Plastics replace the more traditional materials such as aluminum or glass. In order to minimize use of resources and transport cost, the industry manufactures increasingly lighter containers and uses more and more plastic bags as alternatives. Worldwide, about 54.0 million tonnes of plastics were processed into rigid packaging in 2016. Polyvinyl chloride (PVC) and polyethylene terephthalate (PET) might be more famous. However, the top-selling product of 2016 was polypropylene (PP): 23.4% market share. Polypropylene is a semi-crystalline thermoplastic polymer that is compatible with many processing technologies and used in a wide variety of applications. High density polyethylene (HDPE) and linear low-density polyethylene (LLDPE) also belong to the types of plastics that were most frequently used. HDPE is solid and hard. It is processed into films but also into rigid containers, pipes, and a variety of everyday household goods such as flacons, clothes pegs, and handles of dishwashing brushes. Both flexible as well as rigid products are made of linear low density polyethylene, oftentimes in blends with low-density polyethylene (LDPE) or HDPE. Like this, it can be used for example for thinner films. Furthermore, LLDPE is processed into multilayered packaging. Chapter 1 provides a thorough presentation and analysis of the market for plastics – including forecasts up to 2024: The development of demand (tonnes), revenues (dollar and euro), as well as production (tonnes) is depicted for each region. Chapter 2 examines 25 countries of in more detail: France, Germany, Italy, Spain, the Netherlands, the United Kingdom, Poland, Russia, Turkey, Canada, Mexico, the USA, Argentina, Brazil, China, India, Japan,Malaysia, South Korea, Taiwan, Thailand, Iran, Saudi Arabia, Egypt, and South Africa. The country-specific demand and production per product type (polyethylene (LDPE), polyethylene (LLDPE), polyethylene (HDPE), polypropylene (PP), polyvinyl chloride (PVC), polystyrene (PS), expandable polystyrene (EPS), polyethylene terephthalate (PET), polyurethane (PUR), acrylonitrile butadiene styrene (ABS), and other engineering plastics) as well as revenues, import, and export are depicted. Furthermore, demand per individual application areas is analyzed. 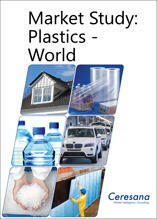 Chapter 3 offers a detailed analysis of applications for plastics. Information is given for the eight segments flexible packaging, rigid packaging, construction, transportation, electrical and electronics, industrial products, and other applications. This chapter examines the demand per country split by the respective sales market. Chapter 4 looks at the individual types of plastics: polyethylene (LDPE), polyethylene (LLDPE), polyethylene (HDPE), polypropylene (PP), polyvinyl chloride (PVC), polystyrene (PS), expandable polystyrene (EPS), polyethylene terephthalate (PET), acrylonitrile butadiene styrene (ABS), polyurethane (PUR), and other engineering plastics. Demand development of the particular plastics per country is evaluated. Chapter 5 provides useful company profiles of the largest producers of plastics, clearly arranged according to contact details, turnover, profit, product range, production sites, capacities, and profile summary. Extensive profiles of 85 manufacturers are given, including BASF SE, Exxon Mobil Corp., The Dow Chemical Company, Total S.A., DuPont (E.I.) De Nemours, Saudi Basic Industries Corp. (SABIC), China National Petroleum Corporation (CNPC), Braskem S.A., LG Chem Ltd., and Sibur Holding PAO.